May 30, 2017 by Nils Oudhuis . Tags " Hamstring, tendinopathy " . They share some good quality information and video’s. Evidence Based Movement (EBM), are current 3rd year Doctoral of Physical Therapy students that reside in the United States. The focus of our page is simplify current scientific research, as it relates to orthopedic and athletic populations, with the goal of helping you better understand it to then apply it appropriately to your patient population. Please feel free to follow us on Instagram @evidencebasedmvmt. Proximal hamstring tendinopathy (or PHT) is pain that is often described in the deep buttocks, and commonly localized to the area of the ischial tuberosity, which may radiate down the posterior thigh (Cushman & Monica, 2015). It is frequently found in distance runners, athletes that function in the sagittal plane (i.e. sprinters), as well as athletes who commonly perform changes in direction during sport (Groom et al 2016). A key characteristic of PHT is that the pain often gets better with a few minutes of activity (such as during a warm-up) BUT then gets worse during or after activities such as running (e.g. during the later portion of the swing phase), lunging, squatting and/or sitting, especially if performed on harder surfaces (Groom et al 2016). Symptoms may also occur during forward trunk bending, hip extension, and/or knee flexion (Cushman & Monica, 2015). PHT is thought to commonly occur without any sort of trauma and progressively becomes worse over time (Lempainen et al 2015). Hypothesized mechanisms include increasing training volume too quickly, excessive static stretching (such as those found in yoga or Pilates poses that require end-range hip flexion) or simply sitting for long periods of time (due to a compression load) (Groom et al 2016). According to Cook et al (2014), resisted isometrics without tendon compression is beneficial for loading muscle AND decreasing tendinopathy symptoms. To support such thinking, a study by Rio et al (2014) demonstrated improvements in patellar tendon pain for a minimum of 45 min after performing 5 sets of 45s holds of moderate intensity isometrics. The later study also identified that isometrics were better for pain relief when compared to isotonic exercise. An appropriate exercise for the following stage is the single-leg glute bridge with hold, which is described as follows…. Groom, T., Malliaras, P., Reiman, M., & Purdam, C. (2016). Proximal Hamstring Tendinopathy: Clinical Aspects of Assessment and Management. JOSPT, 46 (6), 483 – 493. 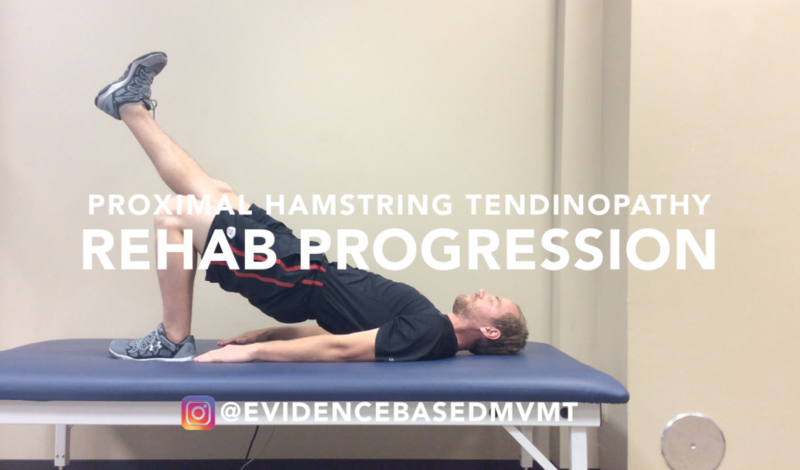 The goal of stage 2 was to incorporate exercises that begin to strengthen the hamstrings in a functional range YET protect the proximal hamstring tendon. The focus in stage 3 is to continue to strengthen the hamstring musculature WHILE increasing into greater ranges of hip flexion. Greater hip flexion stresses the proximal hamstring tendon more to better prepare the hamstrings to return to full functional activities. An appropriate exercise for the following stage is the single-leg RDL (Romanian Deadlift) with a Kettlebell, which is described as follows…. Before returning to play, athletes should be able to meet the demands of their respective sport. For a majority of athletes, this involves the ability to transfer high levels of load quickly as well as accurately. Therefore, incorporating plyometrics and agility drills are appropriate strategies to help establish a functional return to play protocol. It should be noted that the following stage is ONLY needed for athletes requiring those demands described above. With that being said, an appropriate exercise for the following stage is the cycled split squat jump, which is described as follows…. Load Management Part 1: Overuse? or Under-Prepared?